These Texas gearheads aren’t afraid to hit the loud pedal. They say everything is bigger in Texas and, judging from the video of the rigs running though this bounty hole, they have a point. 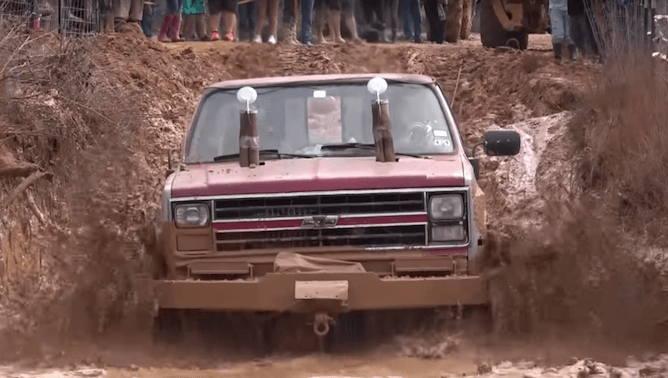 Held at the Creekside Offroad Ranch in Splendora, Texas, MuddFest seems to be a yearly deal that attracts a cubic acre of gonzo-sized trucks and 4x4s. It’s also billed as “18 & Up”, so we’ll let that speak for itself. Perhaps that just refers to the ticket price. Whatever the age range, the variety of machines taking a run through this bounty hole is an absolute riot. Your author’s favorites are the full-sized Chevy trucks, especially the old squarebody that shows up about halfway through the film and … is that a 2×4 serving as the front bumper? Yeah, you’re right – it isn’t. In fact, there’s probably more money shovelled into these rigs than the entirety spent on last three or four project trucks that have darkened my own garage. These are some seriously awesome builds. You gotta check out the absurdly huge RZR towards the end of the video. Creekside Offroad Ranch looks to be a baller spot, too. Advertised as offering some of the finest legal wheeling in the Lone Star State (it’s fantastic they put ‘legal wheeling’ in the description), the grounds feature what sounds like a great mix of mud, sand, and trails. A dozen full-service campground sites mean you don’t have to head home after a day’s wheeling, either. Beyond the MuddFest, Creekside is open on weekends throughout the year. It’s about 45 minutes from Houston and 4 hours from Dallas.